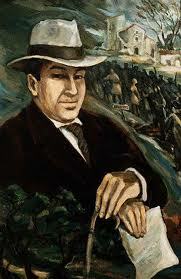 My setting of Antonio Machado's poetry, titled El Limonar Florido (The Lemon Grove in Blossom), was performed twice this year. In the fall John Rommereim led the Grinnell College Singers in a wonderful performance I was able to attend, and just a few weeks ago Diana Saez' great group Cantigas performed it in Washington, D.C. I hope more people will discover this seventeen minute, four movement piece as I feel the poetry is truly beautiful and eloquent, and I am very pleased with my setting which is scored for SATB/solo violin and cello. All the choirs who have sung this piece, plus the audiences, have loved it. The choral parts are average difficulty and here and there present reasonable challenges in various areas of choral singing. Click this link to go to my webpage for the piece- which includes sound files from a very lovely lyrical performance by Calvin College a few years ago, led by Dr. Joel Navarro. This was a commission from John Delorey for the WPI Glee Club’s 135th anniversary. After the wonderful premiere performance in Worcester, MA the group sang it on tour in Spain in the cities of Madrid, Barcelona, and Toledo. I am told by John that the piece received immediate standing ovations in Spain, something which I was very pleased to hear, as I was concerned if Spanish audiences would like what I had done with the dreamscape texts of their most beloved poet of the early twentieth century. One of the most fun parts of the piece occurs in the third movement where I try to create the feeling of Machado's interrupted dream. To do so, I wrote in little percussion parts and oddly intrusive things like whistles and the clicks of toy cricket clickers. When I arrived in Worcester close to the premiere I could see that this was great fun to rehearse, but the overall sound was not what I expected -- it was better! It's not too hard to hear straight choral sound in your head, but this big jumble of singing and odd noises was something I couldn't really imagine. Hearing it in real time with the enthusiastic, willing-to-try-new-things young performers was great fun. The texts for this composition are all early works of the Spanish poet Antonio Machado (1875-1939), and most of them reflect his interest in dreamscapes. They also are quite representative of his style of observation: an object, or especially a series of objects, is simply announced, and then Machado makes or implies an interpretation of their meaning after the fact. Many of these objects are things of simple natural beauty -- a rainbow, a tree, a flock of birds -- yet they seem to also represent some deeper resonance for Machado, often colored by his lifelong melancholy over the death of his wife at an early age. I have used one of his simple observed dreamscape objects, “el limonar florido…” as the title for the whole piece simply because I think it is a wonderful image and because the words have such a beautiful liquid sound. The “tranquil afternoon” is signified by the repetitive cello line, over which the violin plays a very plaintive, meandering melody. The voices speak wistfully of having “had some joys,” and the cello brings the movement to an end by taking the melody first heard in the violin. A “soul light, holy light, beacon” overhead, a man below stumbling on a pilgrimage -- represented in the music by a dirge-like melody in the voices alternating with two string chords with an unsettling dissonance. Who is the man and where is he going? Machado leaves that to the reader to decide. Perhaps it is Machado himself, and he then once again dreams, turning away from the serious dirge to a rather drolly playful conversation with God, initiated musically by the cello. came with a few true words. and be able tenderly to recall them. los magicos cristales de mi súeno? in a beacon of rain and sun. the magic crystal glass of my dream? the water in your hair! a lantern on his shoulder. God shouting at me: Take care! 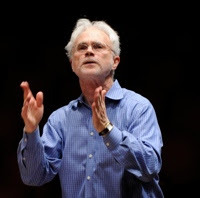 Composer John Adams recently gave a brilliant commencement address to the graduating class of Juilliard. Brilliant in my mind because he asked them to continue challenging themselves over their careers, to reinvent themselves now and then, and to always look for fresh approaches and discoveries. He also addressed the amount of dedication it takes to achieve in the arts, something I think the general public has no idea about. Does the "average" person on the street have any idea how many hours professional musicians practice? they would be shocked to know! Or consider the thousand of hours they already put into the art by the time they were even old enough for college. Along with those hours comes many an hour of doubt and soul-searching. Today we continue the interview of Ethan Sperry, Director of Choral Activities at Portland State University and newly appointed Artistic Director of the Oregon Repertory Singers. Here Ethan talks about his interest in world music and his very active role in bringing it to the U.S. choral world via his series at earthsongs. PC: You've become known for your brilliant folk music series at earthsongs. Can you describe how that series came about? And can you talk about your interest both in Haitian music and in Indian music- including Bollywood? ES: I’ve been interested in Indian music and culture for a long time, then I started working at Miami University and there was an inspirational Indian musician named Srinivas Krishnan. Srini is an engineer from Chennai, India who had come to get his masters in Engineering at Miami in the 1980’s and then stayed in the area to work for Proctor and Gamble. In addition to his scientific skills, he is a phenomenal tabla player, vocalist, and entrepreneur. When I arrived at Miami in 2000, I heard his Global Rhythms ensemble, which at that time was three flutes, a trombone, a cello, a keyboard, and two percussionists (all Miami students) playing an Indian raga while he accompanied on the tabla. Srini doesn’t read Western music notation, so had taught the students the raga melody by ear. The performance was hair-raising and I was inspired by the idea of performing the music of India on Western instruments. I asked Srini if he had ever involved voices in the ensemble, and he said he had always wanted to, but no one had been interested. We started planning, and the next Fall the Miami University Collegiate Chorale joined Global Rhythms for four songs: a spiritual, a Romanian piece by Pascanu, a Cirque du Soleil piece, and a Tarana by Ravi Shankar which was my first arrangement of an Indian piece. The arrangement was scored for unison choir and over a dozen instruments. The Collegiate Chorale has performed in the Global Rhythms concert at Miami every Fall since 2001. The summer after that I got a grant from Miami to travel to Mumbai (Bombay) and Chennai for three weeks to study Indian music. After some study of Indian music theory (mostly Carnatic) and attending a lot of concerts, including many children’s concerts, which really helped me grasp how the theory was put into practice, I decided to try a purely choral arrangement. However, India has no choral tradition and no large ensemble tradition. The music is all improvised and large groups don’t improvise well. So, I decided to fuse two ideas together. I got my start as an arranger singing a cappella in college. In this style we give all the instrumental parts to the voices and use the voice to try and imitate their sounds. I decided to try this same idea on an Indian raga. I chose the raga Ramkali because it strays so far from Western scales. I decided to improvise on the raga as if I were singing the piece and write down my best ideas. Then I did the same thing for the vocal parts, trying to use syllables that would make them sound like the Indian percussion and drone instruments that usually accompany a singer. Ramkali was premiered by the Miami University Men’s Glee Club at the 2004 ACDA Central Division Conference and several people, including Paul Rardin (who was at Michigan at the time) asked for manuscript copies after that performance. Paul brought the piece to Ron Jeffers at earthsongs and he asked to publish it and to begin a series in this style which I named Global Rhythms in honor of Srini and my collaboration. Ron also asked me to produce an SATB version of Ramkali, but I resisted – I really think it’s a male chorus piece and many pieces that are reworked from TTBB to SATB (most notably Franz Biebl’s Ave Maria) suffer from being altered. I suggested that I write another raga in a similar style for SATB chorus and he liked that idea, so I wrote Desh in 2005. I don’t write these pieces quickly, but the series now includes Jai Bhavani (SA - 2007), Dwijavanthi (SATB - 2008), Pallanda (TTBB or SSAA -2009), and Mantra (SATB - 2011). In 2003 I was listening to the Putamayo World Music Hour on NPR and I heard this incredible piece of Haitian music called Peze Café being performed by a choir with drums. I used Putamayo’s website to order the CD and found out that it was a Swedish choir called Amanda that had been singing. The booklet gave me enough information to use google and eventually order the sheet music for the piece from a Swedish website. I also ordered every other piece I could Sten Kallman who had arranged that piece. The sheet music used Western music notation but there were very few performance notes and what notes there were were in Swedish. I got some friends to help translate the notes, and used the CD as a performance guide, and on we went. My students immediately fell in love with his arrangements and a few years later I invited him to come work with us for a week and perform two of his arrangements with us at the 2010 ACDA Central Division Conference in Cincinnati. He also agreed to let me re-publish some of his arrangements as part of my series with earthsongs, this time with much more extensive performance notes that are all in English. While I was in India in 2002 I also became infatuated with Bollywood music. And I had some good luck. Friends of Srini’s introduced me to a number of film composers including A. R. Rahman whose music is truly exceptional. From 2002-2006 I produced about a dozen arrangements of Rahman songs for choir and a very large Global Rhythms ensemble. He came to the US in 2006 and performed them with us in Detroit, Dayton, and at the Hollywood Bowl on my 35th birthday which still stands as one of the highlights of my musical life. Rahman also invited me to conduct some of his music at The Filmfare Awards (the Indian Oscars) in 2008 – another highlight. Over time I was able to produce a few arrangements of his songs for choir and percussion, and Ron agreed to publish these on my series as well. Of these, I am most proud of Zikr. Rahman converted from Hinduism to Islam in his twenties (A. R. stands for Allah Rakha or servant of Allah), and despite having written almost 1000 songs, Zikr is his only statement of faith in music. The media gives a lot of air time to a relatively small group of Muslims who are terrorists, and almost no attention to the millions of Muslims (138 million in India alone) who are not. I hope this song will help some people understand that there’s much more to Islam that Al Qaeda. Ethan Sperry is Director of Choral Activities at Portland State University, where he conducts the world-renowned Chamber Choir and University Choir and leads undergraduate and graduate programs in conducting. Beginning in the Fall of 2011, he will also be the Artistic Director and Conductor of the Oregon Repertory Singers. Sperry also serves as the National Repertoire and Standards Chair for Male Choruses for the American Choral Directors Association and the Vice-President of the Intercollegiate Men’s Choruses. From 2000-2010, Dr. Sperry was on the faculty at Miami University in Ohio where he conducted the Men’s Glee Club, Collegiate Chorale, and Global Rhythms Ensembles. A prolific arranger of World Music for choirs, Dr. Sperry is the editor of the Global Rhythms series for earthsongs music, one of the best-selling choral series in the country. PC: Judging by the joyous interaction I saw between you and your singers that I saw in Cincinnati at the ACDA Central Division Conference in 2010, how hard was it to leave Miami University and start a new position at Portland State this year? What do you think was the key element in that special relationship you had with your singers at Miami? ES: It was very hard to leave my job at Miami University, especially because of how close I was to the students in the choirs. We had formed meaningful bonds and shared some truly special experiences. However, turnover is inevitable in the academic setting. In my ten years at Miami I had watched hundreds of students I was close to graduate and move on. Last year it became my turn. Taking this attitude towards my leaving was actually suggested to me by some of the students, and it helped me adopt the best possible perspective on the situation. And of course we still stay in touch. But I’ve been lucky I guess – I seem to form this kind of relationship with most of singers I work with. But since I was at Miami for ten years, seven years longer than I have held any other teaching position, the bonds ran much deeper than I was used to, and yes it was very difficult to decide to say goodbye. And now that I just read the great piece by Weston Noble on your blog, I’m going to use his word, VULNERABILITY to answer your question. I learned from my father (who is also a musician) that great music is great because it captures some essential human feeling or experience and brings it to life. Our goal as musicians is to make a personal connection with that spark in the music and share it with others. You have to be willing to be vulnerable to do this. As a choral conductor, I spend a great percentage of my rehearsal time on this issue: exploring what the text and music or a piece is trying to say and trying to connect it to our own experiences. I share my thoughts and actively solicit the singers’ thoughts as well. That requires them to be vulnerable too. In my opinion, there is no way NOT to feel close to people once you are that open with them. PC: Oregon and Washington have such amazing choral programs, all the way from children’s choirs through the university choirs. Now that you have been there for a while, to what do you attribute this to? ES: The choir directors I’ve met in Oregon and Washington really know each other and like each other. They all want their programs to be the best, but that does NOT translate into them wanting their colleagues to fail. I find this especially surprising at the high school level. Both Oregon and Washington have state championships for choirs – one choir each year is named #1, and I find that their colleagues congratulate the winner and are happy for them. Then they go home and work harder to try and win the next year. I think this has happened because there are three majors events in Oregon where these choir directors spend significant time together, get to know each other, and really learn from each other and from the best choir directors in the world. One is the Oregon Bach Festival which I think needs no introduction. The second is the Liederkranz Club, a social club of choir directors who go to a beautiful retreat on the Columbia River Gorge each November and invite famous clinicians to come and hang out with them. Everyone you can think of from Robert Shaw to Eric Ericsson have been guests at Liederkranz over the years. The third is Rodney Eichenberger’s Haystack Rock summer conference where choir directors spend a week at Canon Beach sight-reading new releases and working on their conducting. I also want to give some credit to Bruce Browne, my predecessor at Portland State University, who was Director of Choral Activities there from 1978-2006. Bruce tackled the most difficult repertoire possible with the PSU Chamber Choir and was very aggressive in seeking new challenging repertoire for choirs. He was a leader in introducing the music of Tormis, Rautavaara, and a host of other Scandinavian and Baltic composers to the United States. Many of the best high school directors in the Northwest studied with Bruce at PSU and seem to have absorbed a love of this music. It’s crazy to hear so many high schools not only learning but mastering Rautavaara’s Lorca Suite. Taking on this kind of repertoire really raises the bar on what a choir can do. PC: What do you think are the best ways for an aspiring high school director to get into “authentic” folk music of the world and do it well, so that it respects the music and does it justice? How can they conquer the fear of doing it badly? ES: One reason I love performing non-Western music is because I don’t find non-Western ideas in the music. I find basic human emotions and experiences that I have, I share, and I understand. School administrators approach Diversity from the perspective that we need to learn about and highlight human DIFFERENCES. I absolutely hate this approach and think it is exacerbating racial and social problems in our country. When I sing music from another culture I feel how similar I am to people that other people (administrators) keep telling me I’m supposed to be very different from. So, don’t be afraid of performing World Music, because it’s not as different as you think. However, there are differences in vocal technique and style from culture to culture (as there are large differences in technique and style in various types of Western music) and we do want to do justice to all the pieces we sing. The way to learn is by immersion, even just a little bit of immersion in the culture(s) you are interested in. The best way to get an authentic performance is to travel to the place the music is from, meet some musicians, and hear some concerts. For most of us that’s not possible due to time or money or both. But we have recordings. And we live in America: there are communities from almost any foreign culture you can think of in almost every American city, even the small cities. The number of truly phenomenal Indian musicians I met in Dayton, Ohio was staggering to say nothing of Cincinnati. And I’ve never been to Haiti, but I perform a lot of Haitian music. I know lots of Haitians who live in the United States, and I know Western musicians who have lived in Haiti for extended periods. I’ve been to concerts in Haitian communities, and I’ve invited Haitian percussionists to accompany my choirs and talk with my singers. PC: You are one of our up and coming young conductors full of energy and vision. What changes do you envision in the US choral scene over the next ten or twenty years? ES: I’m seeing, well hearing actually, American choirs making a much wider variety of sounds. I’m not referring to pieces that require expanded vocal techniques, I’m talking about choirs changing their sound to suit the piece they are performing. I think this is at the crux of great choral music-making, and I find it very inspiring. Britain has this amazing choral tradition where they all sing so cleanly and so perfectly and I think we have been trying to emulate that for a long time. In doing so we created some beautiful choirs, but I think we missed a lot of musicianship along the way. American choirs have been much more adventurous in programming, not only in championing modern music but in exploring the music of other cultures. I’m glad our concept of choral sound is becoming as flexible as our choice of repertoire. PC: Can you tell us about a) the most influential a-ha moment for you as a student, and who the teacher was and/or the situation b) a similar moment when you felt you, now as a teacher, had made an amazing positive impact upon a student's life and view of music? ES: I had a very powerful experience during my junior year of college while on spring tour with the Harvard Glee Club. We were in Solana Beach, California and were performing at a small church. Not a particularly special concert, not very nice acoustics, not the highlight of our tour. But for some reason, we sang differently that night. For some reason, we blended and tuned so well that I actually felt other people’s voices coming out of my mouth. I even felt myself singing several notes at once. I started looking around, and I could see it one everyone else’s face too, several guys had stopped singing and some were even crying. I don’t think any of us has ever forgotten that concert or that feeling. Before that concert I was pretty sure I was going to be a choir director, but after that concert there was no doubt in my mind. I still don’t know what causes this phenomenon, but I’ve been able to replicate it. Not on demand, and not on purpose, but it’s happened to me twice more as a singer and in about a dozen concerts I’ve conducted. It’s a very powerful and reassuring feeling to know – even if for just an instant - that you’re not alone in the world.